I was intrigued by the promotional flyer that came with this CD. It described the music as ranging from IDM and dark ambient to glitchcore and dark hop. Well, I must admit, some of those terms were new ones on me, but taking a look at each one will certainly give you an idea of the kind of music you will hear on Integral. IDM is an acronym for "Intelligent Dance Music", a term (which has somewhat fallen out of favor) used to describe the kind of electronic dance music popular from the 90's onward that could just as easily be listened to on the dance floor as it could be on your headphones at home. Dark ambient is pretty self-explanatory. Unlike the lighter, unobtrusive backgrounds of Brian Eno's early ambient explorations, or the bright, danceable pop ambience of The Orb, dark ambient explores gloomier realms. Glitchcore is basically building pieces around samplings of "studio glitches". Noise and industrial ambience are paramount to this style. Dark hop, like dark ambient, is the murkier side of hip-hop, danceable music based on hip-hop rhythms, but with a distinctly more sinister feel to it. Mike Palace, aka Horchata, does manage to fuse all of these styles together, creating an unsettling voyage into the darker side of electronica. And if his sound never quite reaches the intensity of the kind of music you'd hear at a rave or in a dance club, it's still often rhythmic, in a slow, downbeat way. It's definitely music for chilling out to. A few of the highlights include the 12-minute long Wind, which blends the sound of wind blowing through long tunnels with creepy critter noises that may be natural, or may be electronic, reminiscent of the kind of music heard on Eno's darkest work, On Land. Dark gothic washes of sound infuse Tar with a feeling of being lost at night, on the wrong side of town, while silent strangers watch you from the shadows as you pass by. There's an undeniable tension in the music, the kind that tends to send little shivers creeping up your spine. On Molt, varying electronic glitches get twisted into clunky rhythms that verge on some sort of "funk of the damned". Other songs, like Rust and Root, feature mutilated voice samples. But sometimes, as on Root, the melody occasionally brightens, letting a little light into the proceedings, which makes for a nice contrast. The album closes with the lullaby-like melody of Soil, which is turned into something unsettling by the distant buzzsaw sounds that cut through it. It reminded me of something from Klaus Shultze's disturbing soundtrack to the film Angst. Artists exploring the ambient style often struggle to create pieces that are distinctive from one another. 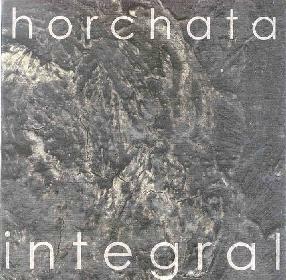 The various tracks on Integral do often cover similar ground, but are varied enough to keep the listener always interested. Take a walk on the dark side! For more information you can visit the Horchata web site at: http://www.zero1media.com/horchata. Contact via snail mail c/o Mike Palace; 90 Pine St; Portsmouth, NH 03801.